After waiting patiently for 2 weeks, I got the car back from the body shop (I told him to take his time and do an A+ job which he did). 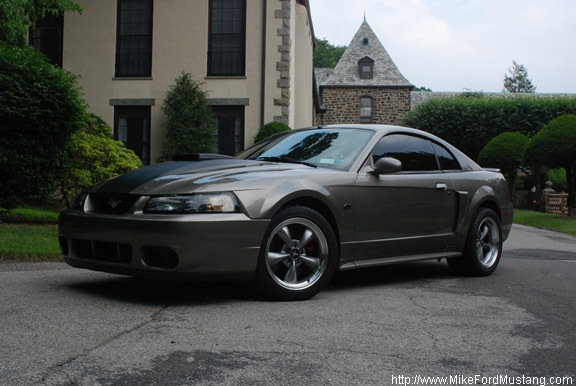 It's a Mach 1 hood w/ Mach 1 Shaker system, flat black stripe painted on the hood, and new 17" deep dish anthracite Bullitt style wheels to go w/ the new dropped look. The stripe is painted, not decal. Also that's just a glare on the front bumper, not any damage. He totally repainted the front bumper. 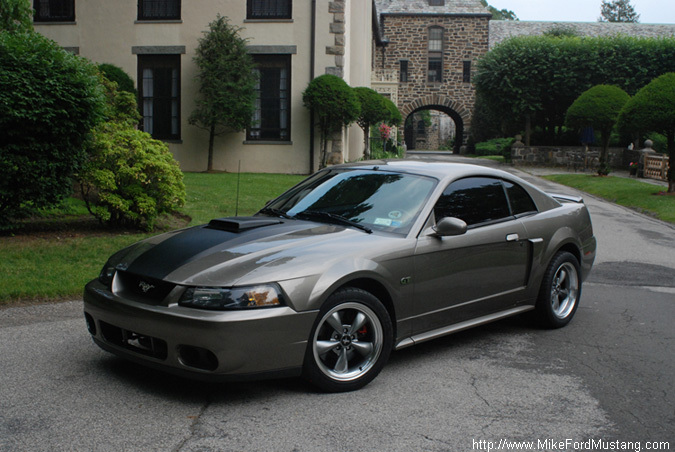 Did you need to replace the hood with as shaker hood and if so where did you find one? 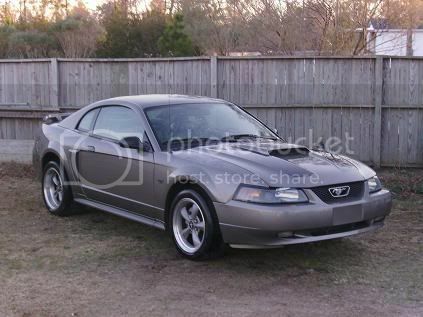 hey i just bought a 2002 GT and I put some deep dish 17" rims was wondering how much did you drop yours I like the way it sits. Good luck, make sure to comment with a picture when you are done! 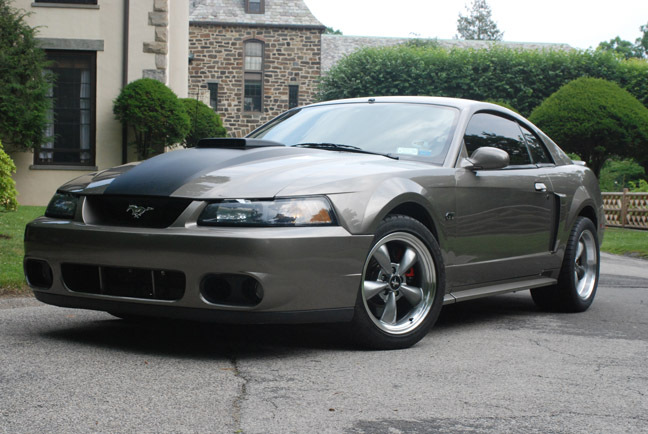 i have a gray shadow mach 1. the front bumper looks great. im thinking to get one of those. nice car. Thank you very much. What do you mean what payment options? 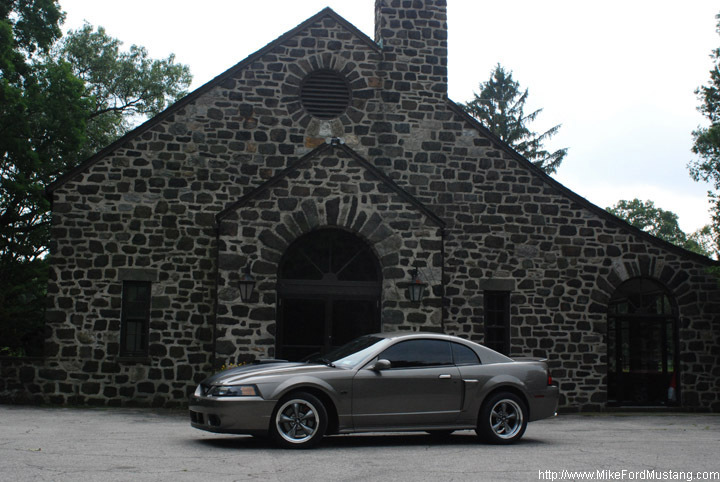 Like your bullitt wheels. Been thinking about getting larger ones for the rears. Where did you get them? 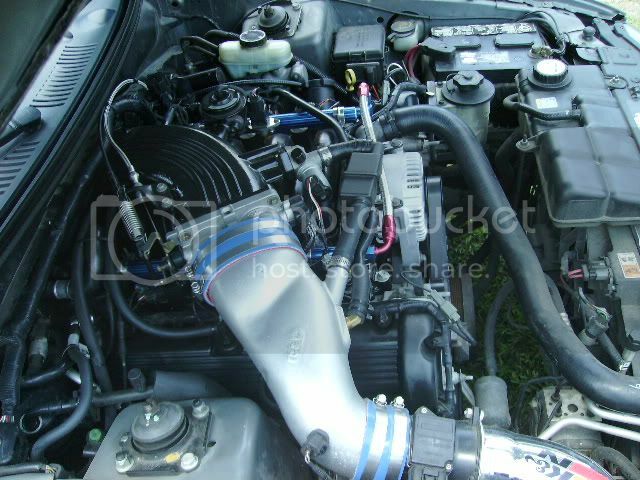 What mods were you running to get 13.1 on all motor? Looking good! Whats you're best time? 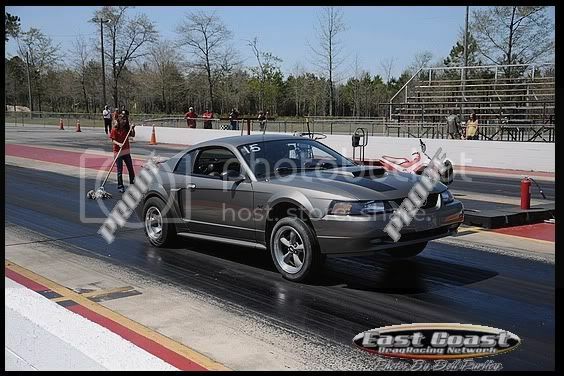 Not bad for coasting half the way ...LOL!!! Very nice!! What do you have done to it? Looks like a nice launch. Thanks man, the Vortech is great. 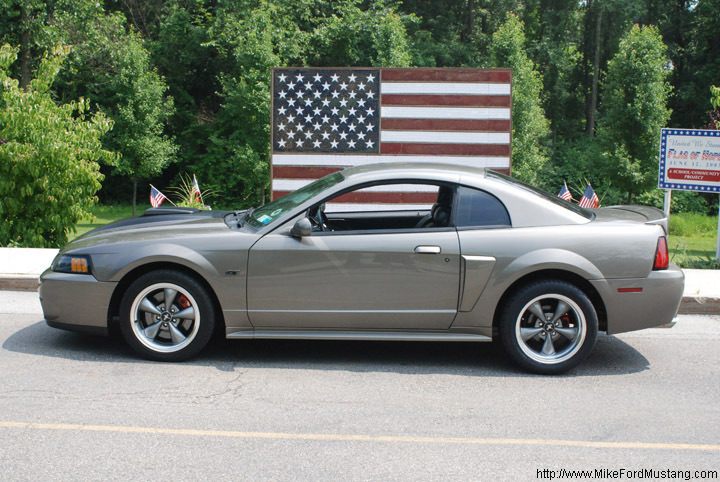 What kind/year of Mustang do you have? Eric Gordon – chelmsford mass. i like what you have done with the hood and the car itself. 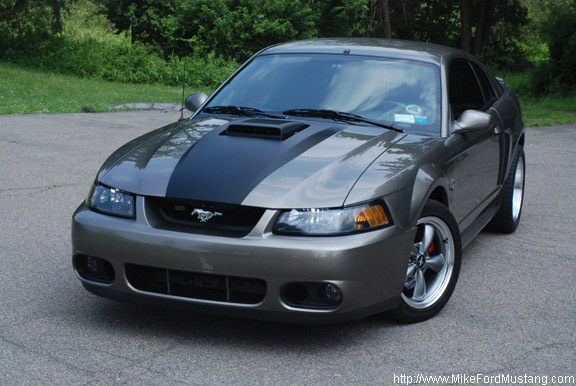 did the shaker hood add any noticeable horsepower? Hey, thanks for the compliments. To be honest with you I didnt feel any notice at all. I would say at most it gave me 0-5 HP. Did you have to shave the horns on the cobra bumper to get the shaker hood to fit correctly, or is the shaker a short hood like the cobra? 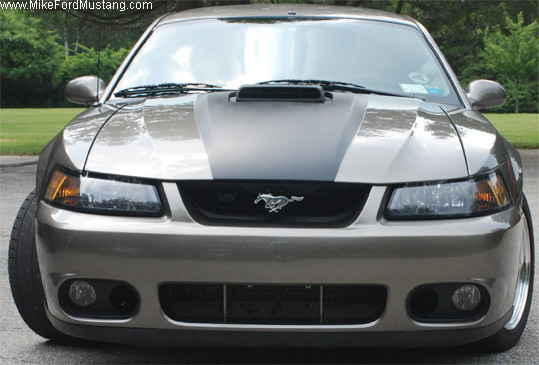 I just got the cobra front end for my 04 gt, and i want the shaker hood, but i dont want to shave the horns to fit my gt hood if it is gonna mess up the line for the shaker hood. You don't have to touch the horns at all. The install was very simple, direct bolt on...however the company I bought the brackets to hold the shaker from does not sell them anymore so you will have to make your own. 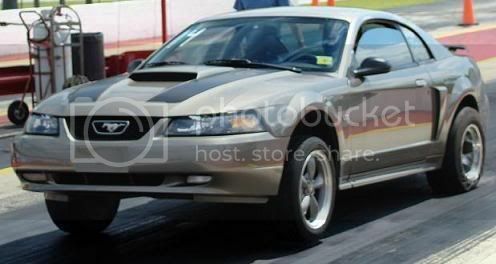 You could also adapt the CDC shaker to fit the stock Mach 1 hood. There's a write-up on the site here. 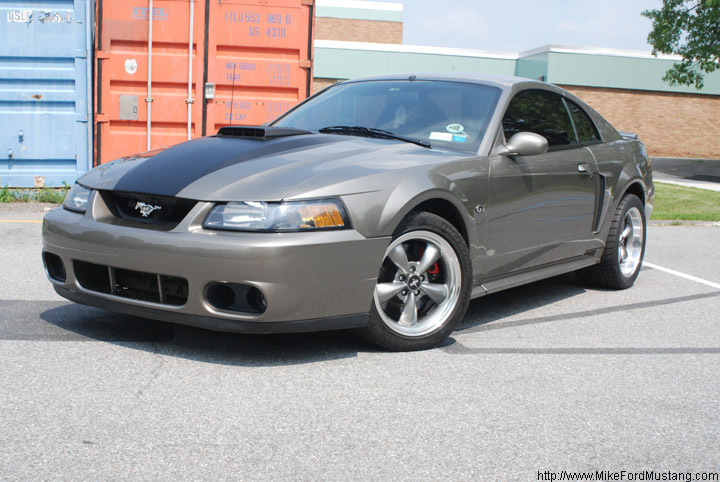 I have the CDC shaker kit on my 02 Mineral Grey GT, and at speeds above 80mph the shaker hood begins to vibrate or fluctuate up and down rapidly, causing the hood itself to fluctuate up and down as well. I was wondering if you have the same problem. Hey thanks for looking at my site...My shaker system doesn't vibrate or fluctuate at all at any speeds. Make sure all the bolts are tight that attaches the scoop to the motor. How many miles does your engine have? It is likely your motor that is vibrating, but I could be wrong. Shoot me an e-mail and I may be able to help you a little better. Beautiful Car, Best color on Gt.